Hiking | Fit Girl. Happy Girl. It’s warm, do some trail running! I have always joked that spring time in New England is comparable to Fantasia – everyone comes out of the woodwork and is rejuvenated, happy and ready to be outdoors. At least that’s how I feel! I am lucky to live in western Massachusetts, rich with hiking trails and home of the Berkshires. Today was a beautiful weather, a ripe 72 degrees, which is rare for the beginning of March in New England, so I decided to take advantage. I grabbed a friend, filled my water bottle and hit a trail located less than a mile from my apartment. I discovered the trail a few days ago on my ride home from the gym. I had noticed cars parked near a clearing at the side of the rode before but never stopped to check it out. Turns out the entrance near my apartment is part of the Robert Frost Trail, a 47 mile long trek that spans from the Holyoke Grange in South Hadley, Mass. to Wendell State Forest. The trail has a ton of scenic spots including the Holyoke Range, Mount Orient, Puffer’s Pond and Mount Toby. Overall the trail’s terrain is relatively easy with some steep inclines and rugged areas. This trail is great for running because although there are inclines at some of the more mountainous spots, there are opportunities for loop-hikes and it has offshoots of shorter trails. Also, the terrain is pretty clear and flat, making for an easier run. The trail is considered a “literary trail” and named after the famed poet, Robert Frost, who lived and taught in the Amherst area from 1916 to 1938. The Robert Frost Trail is among several other literary trails in the Amherst area and they are aimed to connect the area’s literary tradition with it’s rich landscape. 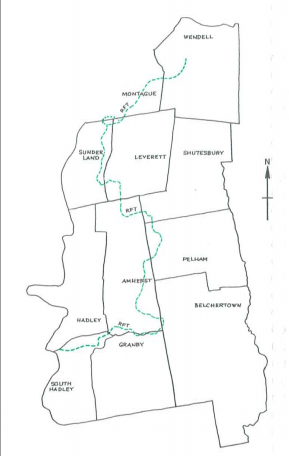 The Amherst Conservation Department has a full listing and map on their website of other literary trails.